The Legend of Zelda: Ocarina of Time is the best Zelda game ever released, at least according to the professionals' review score average for the game. It was the first 3D Zelda game(in two ways), and it was the first Zelda game I can remember playing through to completion. I digress! The Legend of Zelda: Ocarina of Time originally released for the Nintendo 64 on November 23, 1998 in North America. The game was developed at Nintendo's EAD studio, and published by Nintendo. It was re-released on the GameCube, the Wii's Virtual Console, and the 3DS this past June. The Virtual Console release received an "Everyone" rating from the ESRB with "Violence" listed as content for parents and gamers to be aware of, and it is available for just 1,000 Wii Points, which is only $10. 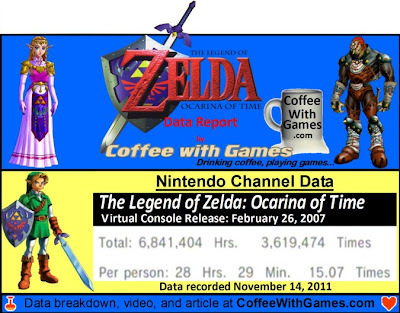 How many Wii owners have reported playing The Legend of Zelda: Ocarina of Time on the Virtual Console, and how many hours have they spent with the game? Let's take a look! 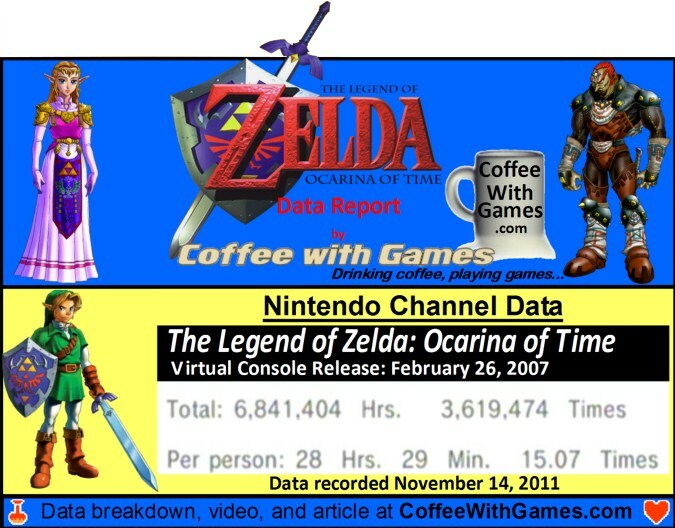 The Legend of Zelda: Ocarina of Time has 240,177 Wii owners that have reported game-play data through the Nintendo Channel in the United States, with 1,722 days possibly reported. Can you imagine playing Ocarina of Time every single day, 24/7, just for 10 years, well the "Total Hours" reported are equivalent to more than 780 years of game-play! The game's average play-time per day/session reported is 1 Hour 53 Minutes. This simply means that when Wii owners are sitting down and playing the game, they are playing it for nearly 2 hours before stopping and picking it up again at a later time. How much has Nintendo made from the game's Virtual Console re-release? Ocarina of Time's Virtual Console release, just in the United States, has made Nintendo about $2,401,770 based on the number of Wii owners having reported data and the game's $10 price point. I remember enjoying my time with the game, specifically fishing a lot, but I remember being very disappointed with the ending. It was a shallow reason that I didn't like the ending, but at the time I remember being very disappointed with it. What was I disappointed with? For some reason, I thought the ending of Ocarina of Time was very much like the ending from Star Wars: Episode VI - The Return of the Jedi with the dancing Ewoks and celebration; and it just felt like a ripoff from the movie. Perhaps I should give the game another try now that a decade has passed? I think the average hours "Per person" and the game's $10 price point, probably make this the best Zelda game on the Virtual Console for Wii owners to purchase. While the game takes more time/dedication to complete, the fact that the game provides so many hours of game-play at such a low price I think is a great value. Have any of you been playing any version of The Legend of Zelda: Ocarina of Time lately, in preparation for Skyward Sword's release today? If you own the 3DS version and you have completed it, do you know how many hours it took you to finish? Thanks for stopping by and commenting! Do you own it on the N64, VC, and 3DS? I own the original cartridge and the 3DS version. The latter took me approximately 19 hours for one completion. 19 hours is good, especially with the "Master Quest" for extra game-play. Think I logged about 5 hours into OOT 3D and aren't very far along. Sometimes it's a little to 3D for me so I like going back to Four Swords for a bit. Are you saying the 3D as in, roaming around in the 3D world is a bit much for you? Or, the actual 3DS' 3D display is a bit much? Coffee, that's a good point. In this situation I mean the 3D world and gameplay in 3rd person, not the 3DS' display. Sometimes it's a nice change of pace to switch back to a 2D top-down zelda. I'm hoping other zelda titles will hit the eShop VC at some point. Think I logged about 5 hours into OOT 3D and aren't very far along. Sometimes it's a little too 3D for me so I like going back to Four Swords for a bit. 19 hours is good, and especially with the "Master Quest" for extra game-play. Coffee, that's a good point. In this situation I mean the 3D world and gameplay in 3rd person, not the 3DS's display. Sometimes it's a nice change of pace to switch back to a 2D top-down zelda. I'm hoping other zelda titles will hit the eShop VC at some point.